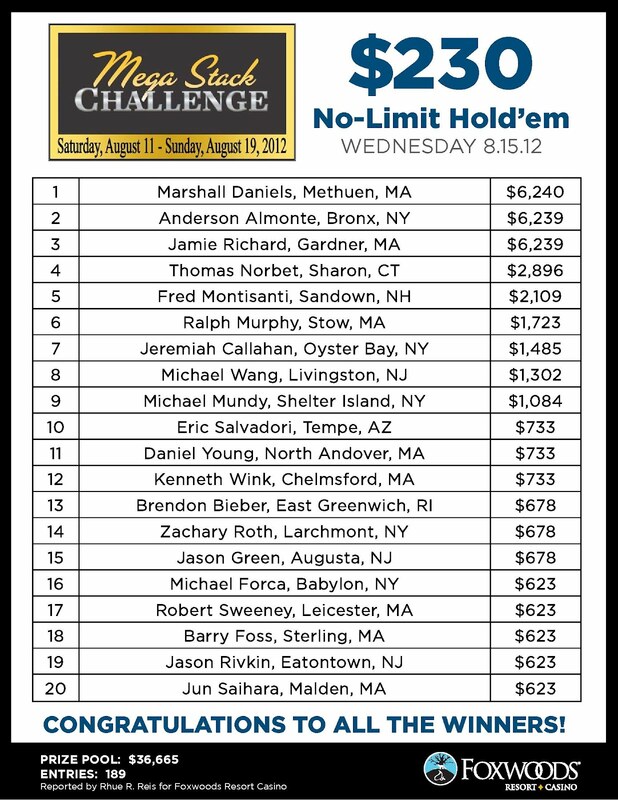 We are down to the final 19 players in the $400 Mega Stack Challenge. Play is scheduled to continue tonight for two more levels or the final table, whichever comes first. 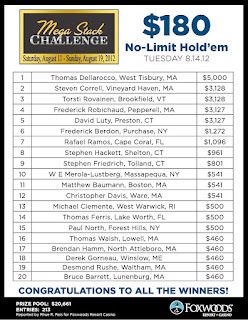 The final table will be streamed live at noon tomorrow on www.FoxwoodsLive.com. 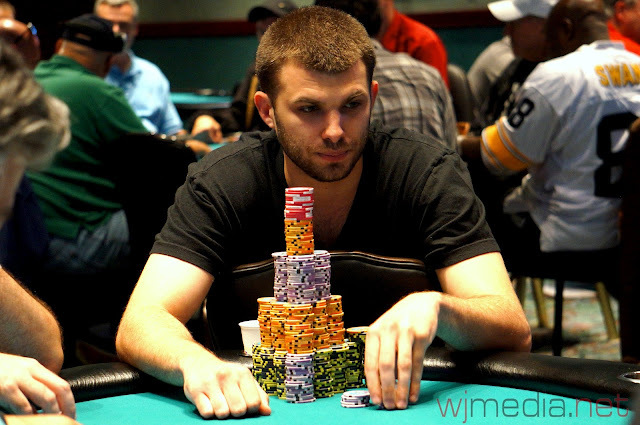 With just 68 players remaining and the chip average at 68,500, Nick Palma has taken a commanding chip lead on Day 1 of the $400 Mega Stack Challenge with nearly 300,000 chips. 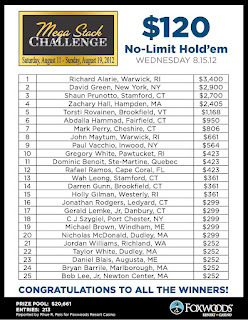 Palma is looking for another victory in the same event he won in March of this year during the Foxwoods Poker Classic. In that $400 event, Palma took home $23,630 for first place. 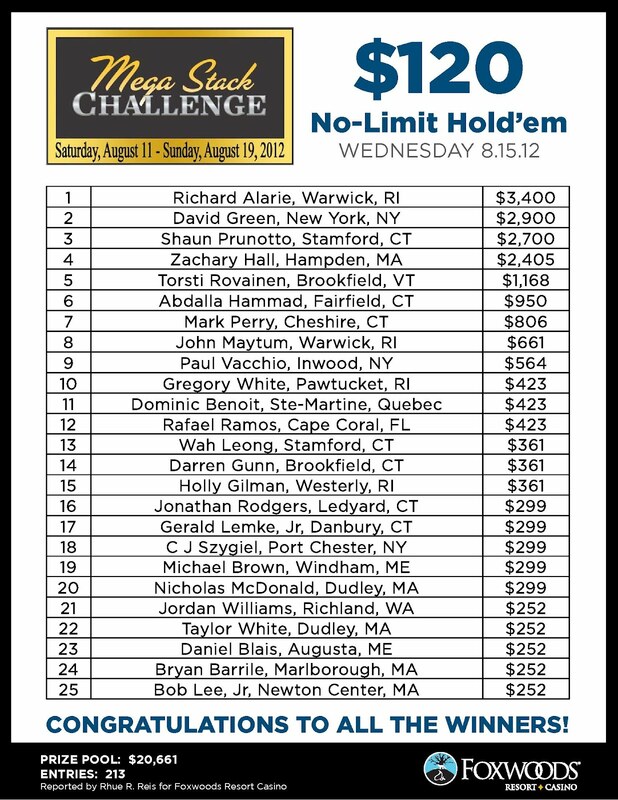 The players on Day One of the $400 Mega Stack Challenge are now on a one-hour dinner break. 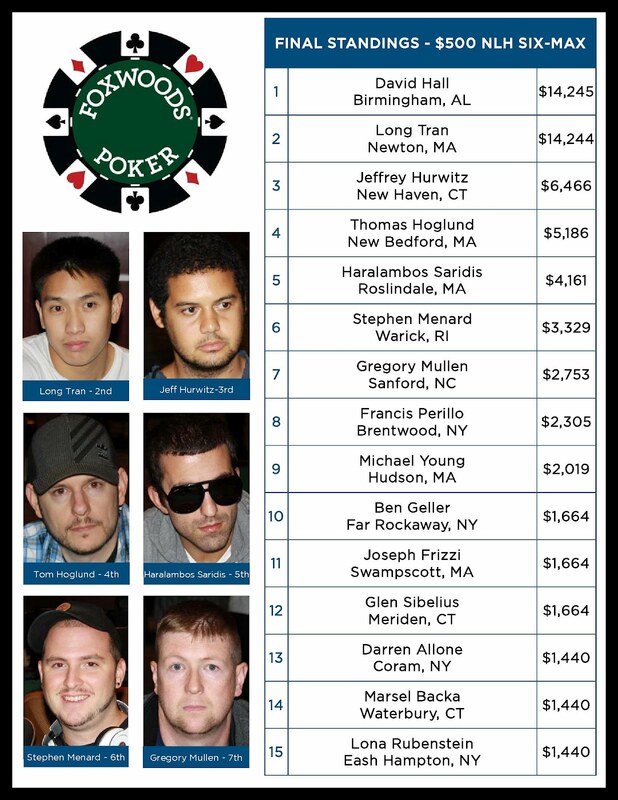 There are 75 players remaining and the average chip stack is just over 75,700. 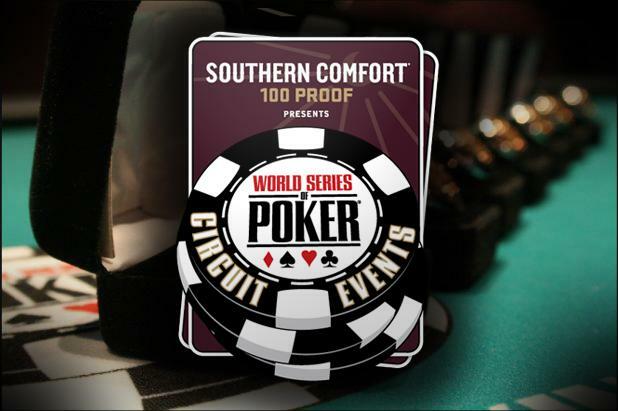 Play against the best Circuit grinders in the country and earn your spot in the 2013 World Series of Poker National Championship. We had a total of 284 players in the $400 No-Limit Hold 'em Mega Stack event. 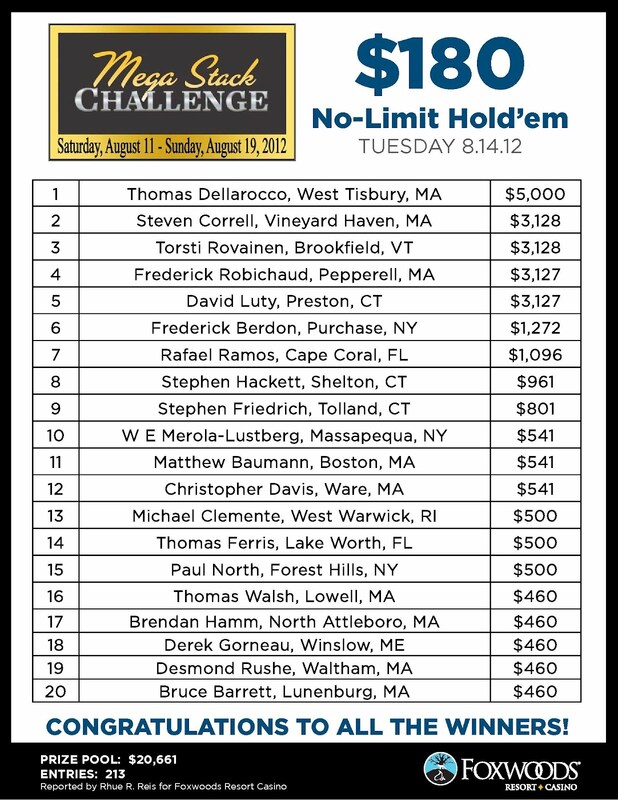 The $400 Mega Stack Challenge event is underway. 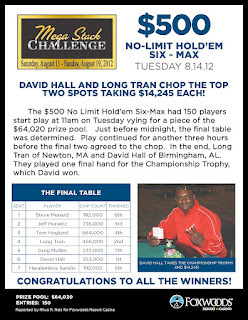 This event features a $75,000 guaranteed prize pool. 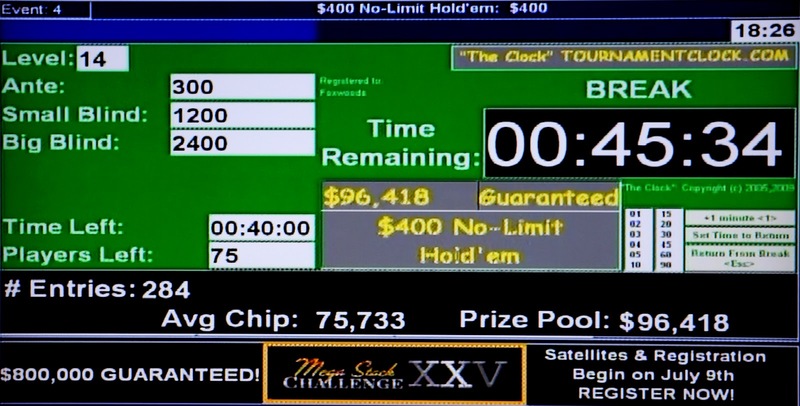 Players start with 20,000 chips and the first twelve levels are 30 minutes in length. Every level after that will be 40 minutes in length. The blinds are currently 75-150.